Visiting the Musée Marc Chagall, Nice, France. This collection is built around The Biblical Message, showcasing works of Marc Chagall's career: paintings, drawings, stained-glass windows and sculptures in the post-war era. The museum was created with the generosity of the artist and his wife. 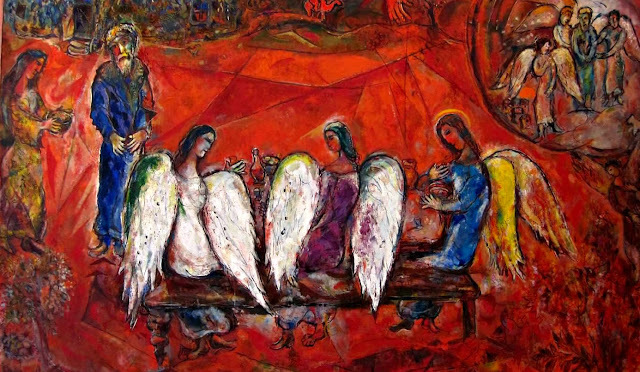 When in July 1966, Marc and Valentina Chagall donated seventeen paintings. Chagall opened the museum here himself in 1973. Marc Chagall was born Moishe Shagal on July 7, 1887, in what is now Belarus, Russia, to a poor Jewish family, he was one of nine children. His father, Zakhar Chagall, worked in a fish factory and his mother, Ida Chagall, worked in the family home and ran a grocery store.